The LG DLE5001W is an electric dryer equipped with multiple functions and customizable features. This 7.3 cu. ft. dryer has 12 cycle options and a SensorDry system that switches off the appliance when clothes are without moisture. Drying clothes in huge volumes faster and less frequently is possible with this model. The 7.3 cu. ft. LG DLE5001W saves more time by allowing you to do huge volumes of laundry in just one or two cycles. Allot more time to other parts of life that don't require a laundry basket. There's nothing worse than pulling damp clothes out of the dryer. The SensorDry system of the DLE5001W dryer automatically sets the drying time based on the moisture levels of the cloth, hence, each load is dried completely. There are 12 drying cycles to choose from. Each is monitored by a Precise Temperature Control technology, which gives professional drying results every time. 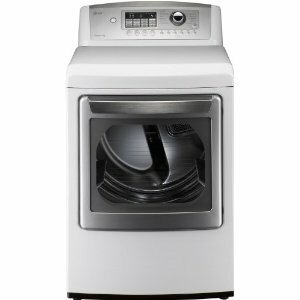 The LG DLE5001W Dryer is also equipped with a FlowSense Duct Clogging Indicator that be used to determine when the ducts need cleaning. With a clog-free duct, efficient and economical cycles are insured every time. Its NeveRust stainless steel drum can give a lifetime of service to its owners because even with repetitive use, there is minimal wear and tear apparent. The top plate and cabinet are both painted steel, which provides a classy look that cannot be tarnished with rust. The control panel is plastic with adjustable knobs and touch pad, allowing easy adjustment for settings. The door rim is coated with chrome while the glass door is transparent, which makes it easier for to check if clothes are ready to be removed. The LED Display indicator and electronic control panel allow adjustment to your preferred settings. Have complete control over the functions and cycles of your dryer. There are 12 different drying programs that you can choose from so that you can dry your clothes without damaging delicate items. Allot for different sensitivities of various fabrics and give each load its required care. There are 5 temperature level settings, perfect for all your drying needs. Have control over how you want to dry your clothes. A removable drying rack is already installed for drying sneakers, stuffed toys, sweaters and other delicate items without them undergoing the tumbling process of drying. The LG DLE5001W is also equipped with a Wrinkle Care System that reduces, if not completely eliminates, wrinkles. You can have the option to forego ironing after. There is only one color available for the model. People who want their furniture and appliances match the theme of their homes will not find this appealing. Purchasing one can be very heavy on the pockets of some. We brought This unit from HHgreg just a little over a year ago.A lady called to sell an extended warrenty when we said no that same day the dryer quit heating.HHgreg said it nothing they could do we would have to pay to fix it.I would not buy anything else from them or LG appliance.